I've been following Interlude in Prague ever since I read Variety's article from last April when the film was shooting on location in Prague (watch the trailer). The plot was to be set around the time Mozart composed his opera Don Giovanni in 1787. As a British release, the film's London premiere was held on May 25th and followed by many UK screenings. It is currently seeking broader distribution. Since I have a background with British Mozart films (In Search of Mozart and Whom The Gods Love) and I've pursued Mozart's history in Prague through travel (three trips to date), organizational involvement and independent study, it made sense for me to reach out to Carnaby International in hopes that I could write a review. I'm grateful for the opportunity to recognize a new film inspired by Don Giovanni on the 230th anniversary of its premiere. Today! Interlude is historically book-ended by two performances conducted by Mozart at the Nostitz Theater (now known as the Estates Theater), although fictionally narrated. The film begins in December 1786 when Mozart is visiting Prague to conduct his opera Le nozze di Figaro and it ends with Mozart conducting the premiere of Don Giovanni on October 29, 1787. The romance and tragedy that develops during the time between these performances is what inspires Mozart's writing for Don Giovanni. As advertised, Interlude is a fictional period thriller, so don't be surprised that the timeline, characters and script embody historical inaccuracies. Mozart, who was blonde and left-handed, is brunette and right-handed. While the Nostitz Theater is captured in the film's exterior shots, a nearby Baroque theater was utilized for the interior shots. You get the point. Although there is some historical authenticity and integrity to their approach, you'll enjoy this film best if you embrace it as entertainment and leave your historian hat at home! With popular culture being saturated with the likes of Amadeus, its comparison to Interlude is inevitable. What binds the two is their overarching fiction sprinkled with fact along with the acute focus on an adversary. Amadeus gave us rival composer Antonio Salieri, who was a real colleague. An equally brilliant choice for Interlude is Baron Saloka, a malevolent aristocrat who although fictional, is representative of Mozart's biography. Mozart dealt with his fair share of narcissistic and formidable members of the aristocracy who knew little about music, yet dictated his own through their wealth and influence. They were obstacles to navigate and overcome. Baron Saloka, in Interlude's fictional world, is just another pain in the Arsch for the Maestro (or is he?). While these affluent patrons were a means for his art, they were also a significant hindrance. Mozart spent most of his life creating within the framework of this patronage system, and eventually became one of the first artists to declare his independence from it. His emancipation informs part of Interlude's script. Captured excellently by James Purefoy, Baron Saloka is a most unsavory individual. Ominous. He essentially is the rogue nobleman Don Giovanni, but without any glimmer of the comedy (dramma giocoso) afforded by Mozart and Da Ponte. Without expression and conscience, Saloka was a dark and disturbing presence throughout the film, and undoubtedly served as inspiration for the title character. Interlude essentially represents Mozart's encounter with the infamous libertine, an encounter that leads to confrontation and composition. 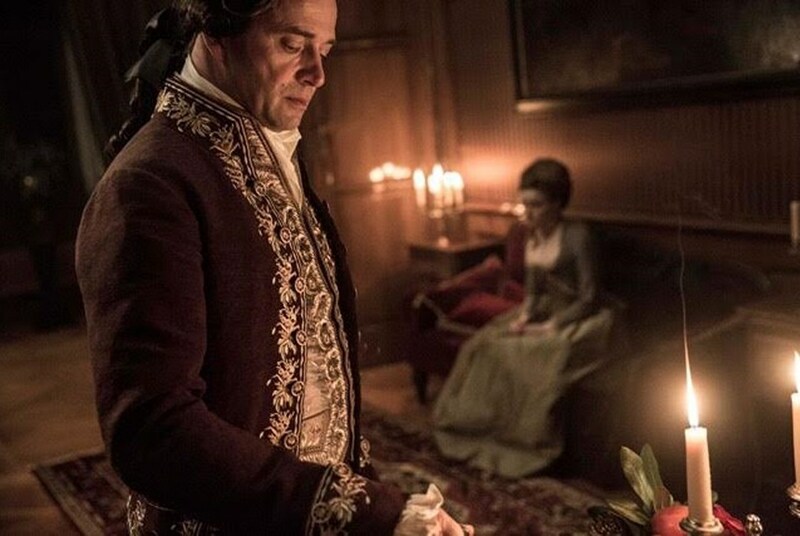 While many of the main characters in the film are fictional, they all represent in some way individuals from Mozart's biography, just as is the case with Baron Saloka. Another character, the young soprano Zuzanna Lubtak, represents the singers with which Mozart enjoyed flirtatious muse-creator relationships throughout his career. The real characters in the film were more historically informed. I enjoyed the manner in which the friendship between Mozart and Josepha Duschek was portrayed. Their professional respect was acknowledged along with the enjoyment of their shared star status in Prague. Mozart's wife Constanze only appeared briefly, but within that time, the script communicates that their marriage is strong and she takes an active role in his business affairs. It hints at Constanze's savvy that would someday lead to her success in managing his Estate. Just like the opera, the film sways between light and dark, and character shadings comply. Mozart's role as composer was minimized in order to bring the man forward, and it worked well to suit the plot. Although I found his character romanticized, I didn't feel that it was without merit. 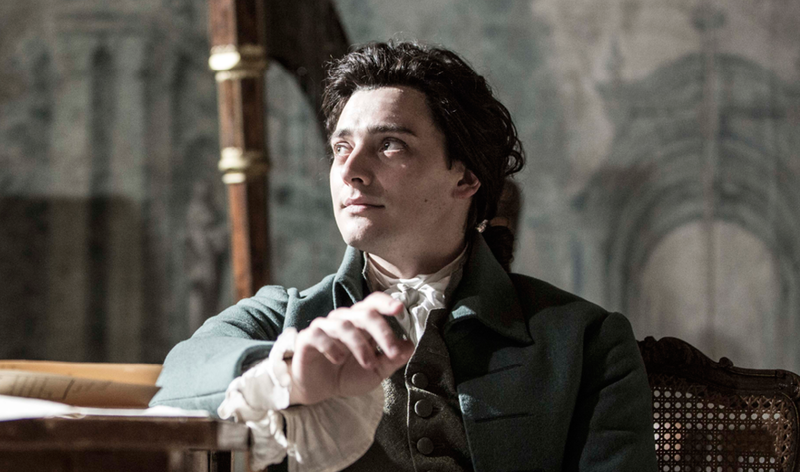 Aneurin Barnard delivered a sensitive and sincere Mozart to the screen. Like a pendulum, he would swing between moments of joviality and melancholy. Barnard's depiction gave you the sense that Mozart was struggling to balance the two in his life, something one can surmise from reading his letters. 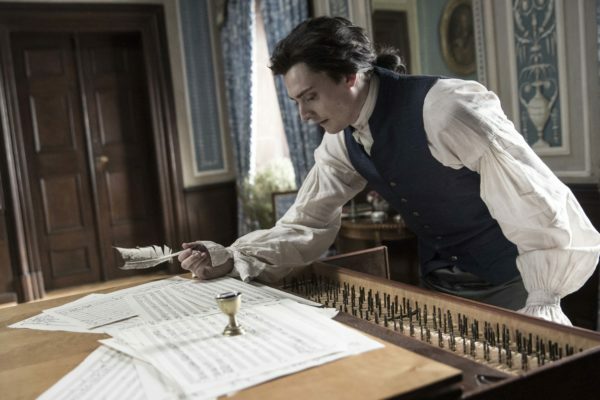 Mozart's music, although present often in the film, takes somewhat of a backseat to the thriller and its original soundtrack. Although Mozartians may pine for more excerpts, it makes sense for the overall aesthetic. The cinematography is very modern, so initially, I felt disconnected as a viewer. It didn't have the feel of a period film. But the approach made sense when I watched the featurette afterwards. "I wanted it to look like a modern film and be cut like a modern thriller," said Director John Stephenson. He wanted Interlude to appear "as if a modern film unit arrived in the days of Mozart and shot it using everything available from visual effects all the way to modern camera techniques." With its opulent sets and costumes, Interlude is beautifully crafted as an interval, an incomplete look into Mozart's life through the prism of contemporary filmmaking and storytelling. It was made to appeal to a broader audience beyond the core of Mozart fans and I applaud their effort. 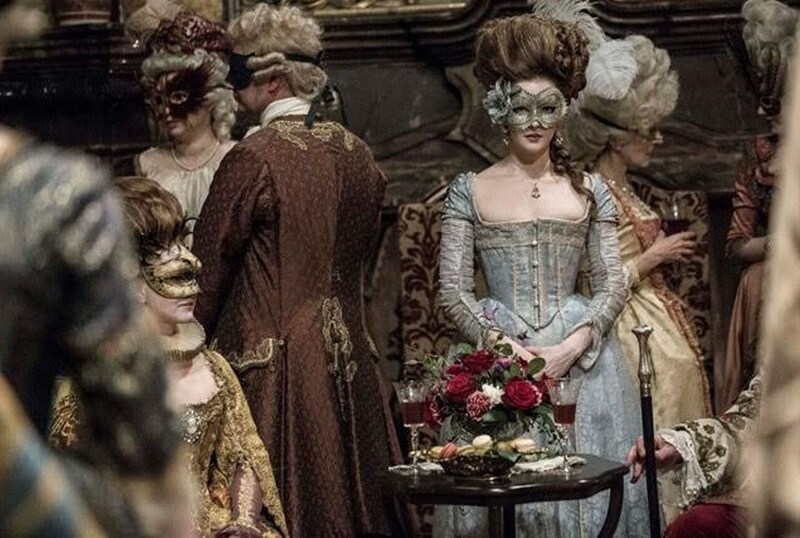 Dramatic license and entertainment value in period films have a transcendent ability to attract new audiences and rekindle passion in existing ones. My hope is that Interlude will perform well in this role, and more specifically, serve as a reminder of the enduring appeal of Mozart's Don Giovanni on its 230th anniversary.